Mr and Mrs Cane finally found time to catch up with us, and I had to make good on my promise to take them to Petrus. 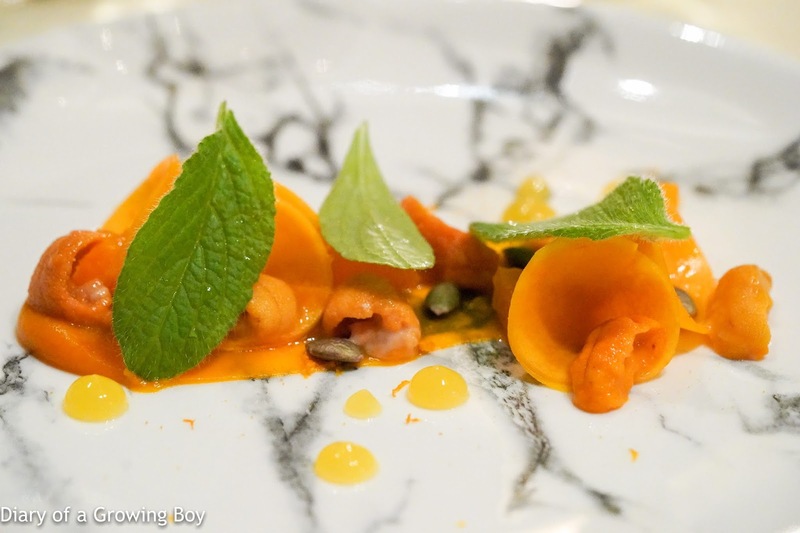 I have been preaching about Ricardo Chaneton's cuisine over the last 18 months to anyone who would listen, and I'm glad that more of my friends are giving this young chef a chance to show them his stuff. As usual, I sent off the list of Mr. Cane's dietary restrictions to Ricardo. We've been lucky so far, as all the restaurants in which we have dined together have been careful. I told Ricardo that he could keep the element of surprise and not show me the menu in advance, as long as he is aware of what's off-limits. 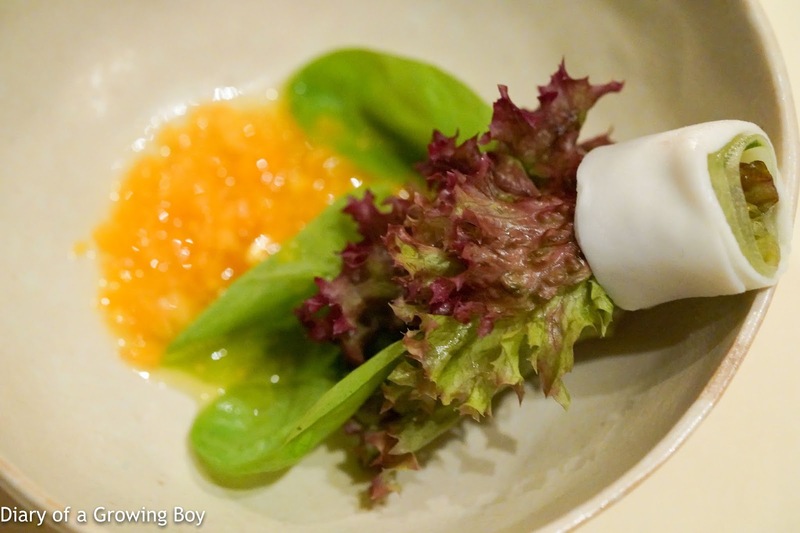 Rooftop bouquet, gooseberry vinaigrette, Colonnata lard - I love that Ricardo has his hydroponic garden on the rooftop of the hotel, and it's wonderful that the powers that be gave him the freedom to do it. The greens were still bundled together with a ribbon of lardo di Colonnata, but the "dip" today was made with gooseberries, olive oil, and white balsamic. 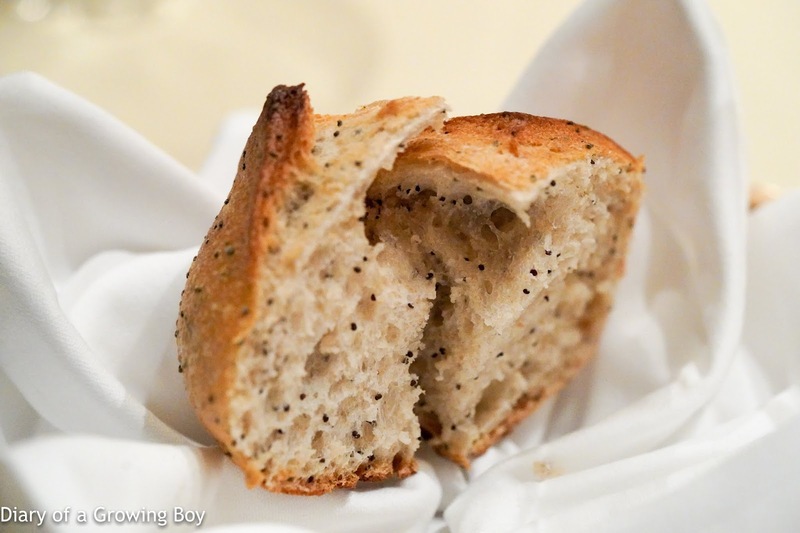 It took me a little before I realized that the poppy seed sourdough bread comes to the table in similar fashion to the way that bread is served at Mirazur - although this one didn't come with a poem. But the bread was totally delicious, and Mr. Cane couldn't help himself. 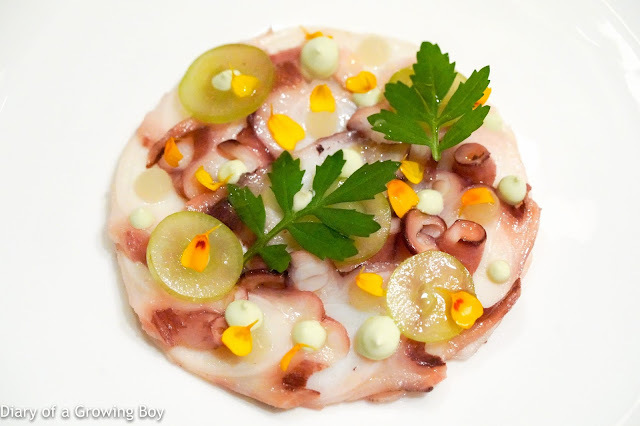 Galician octopus carpaccio, grapes, rosemary condiment - the slices of Galician octopus came with pretty nice texture, and the slices of grapes provided some refreshing sweetness. The dots of rosemary cream were pretty strong. As delicious as this was, it unfortunately clashed with the Puligny-Montrachet... and brought out a lot of metallic and even a bit of strong "fishy" flavors. 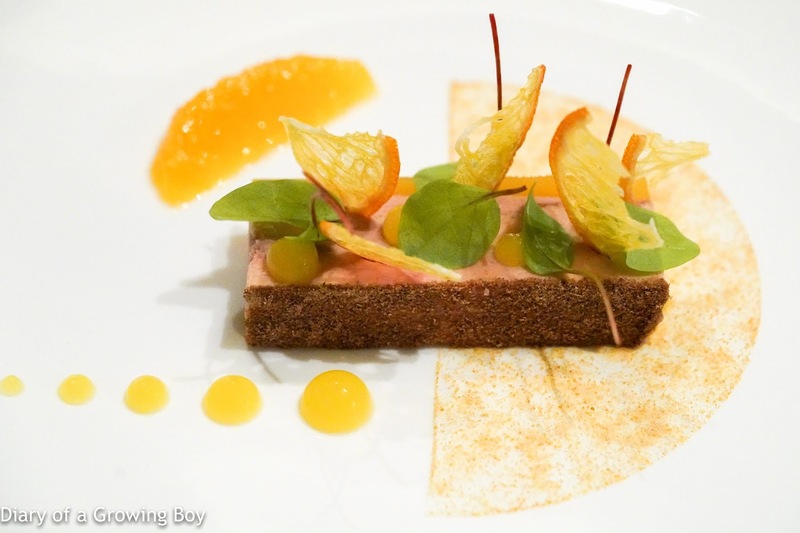 Duck foie gras terrine, navel orange and three-spices - this was supposed to be the dish for Mr. Cane, but I'm thinking that Ricardo forgot that foie gras classifies as an organ... So the rest of us got a taste of the dish. The terrine was very smooth, and there was the distinct flavor of cumin. Here we've got variations of the navel orange, from a simple wedge to gel to dehydrated wafer, and finally powder. Oh, there was also a strip of orange jelly down one side of the terrine. 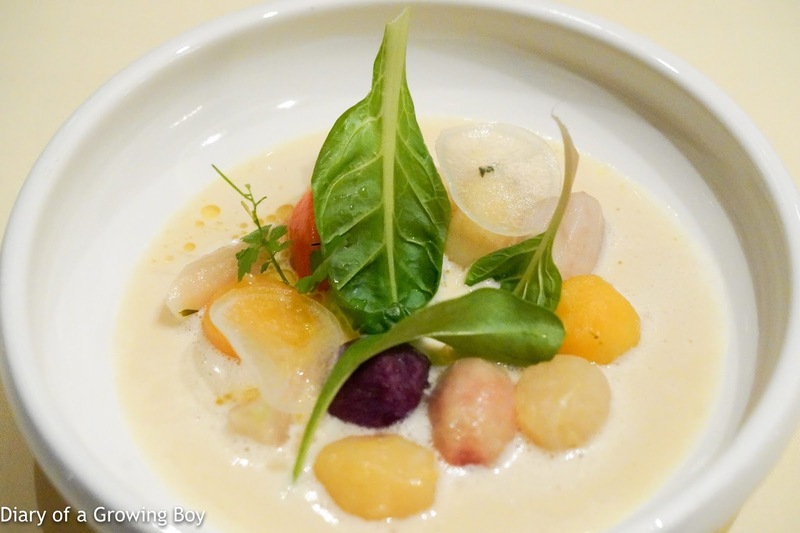 Heirloom roots ragout in "cocotte", old Parmesan cheese bouillon - in a move that is a clear departure from many chefs in town, Ricardo said he wanted to show us a dish that was "very humble but from the heart". No bling-bling premium ingredient here... just 12 different kinds of root vegetables which had been cooked separately with butter, garlic, and thyme. The liquid from the cooking process were infused with some Parmesan and turned into a bouillon. We've got parsnip, celeriac, salsify, heirloom carrots from Annie Bertin, two different types of sweet potatoes, ratte potatoes, radish, and turnip. Oh, and we've got some kind of beetroot, too... On top are herbs from the restaurant's own garden, including Swiss chard and watercress. I really loved this dish. It's all about the purity of flavors from the ingredients, without a lot of fancy tricks to manipulate it or to dress it up. Hello Kitty enjoyed it, too... except the beetroot of course. But one problem with the dish is that the volume of food is simply too much. When you have so many different types of root vegetables, even balls that look small would add up. I started feeling full after finishing this dish. 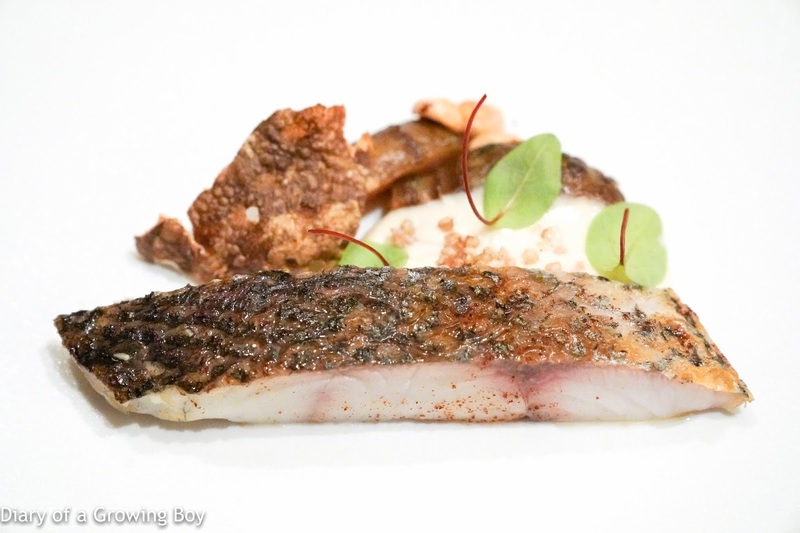 Corsican meagre, Jerusalem artichokes, Piedmonte hazelnuts - the texture and execution of the meagre was fine, but I found it a little under-seasoned. It came with roasted Jerusalem artichokes as well as a few chips, and some crushed hazelnuts. We were shown two pigeons which had been roasted, so we knew what was coming. 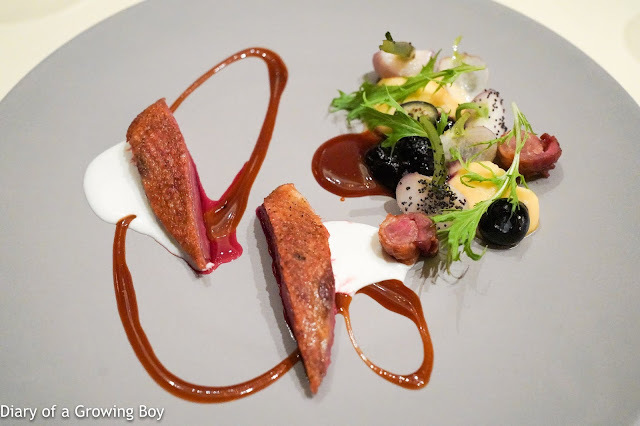 Miéral pigeon, Roquefort, blueberries, turnip - the leg of the pigeon has been cooked confit, and came with some blueberries, turnip, mizuna (水菜), poppy seeds, and a bitter purée. 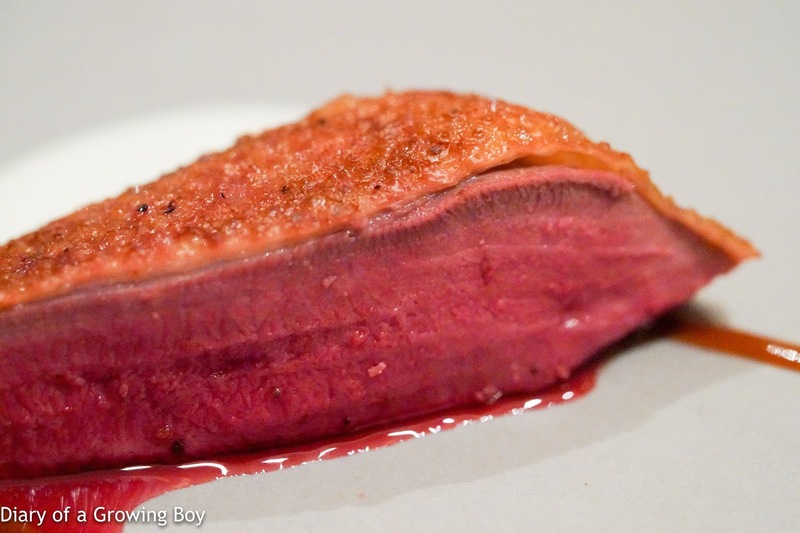 The Bresse pigeon breast was very nicely done, but I found the Roquefort sauce a little too strong for my liking. Still, it's always good when pigeon is on the menu. 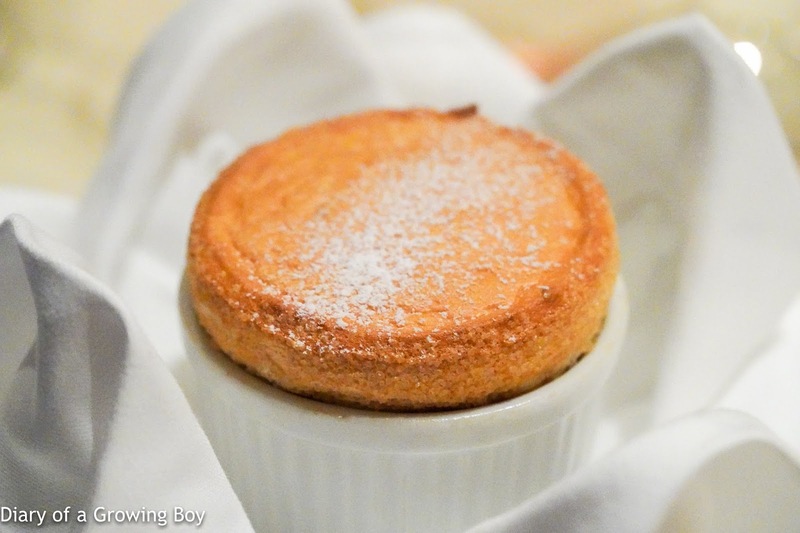 Parsnip and coffee soufflé - while others got the "regular" soufflé with passion fruit, Ricardo decided to send us something that he was testing. I can't say that I tasted much of parsnip, but the coffee was pretty nice... and as Hello Kitty noted, when the coffee flavors don't slap you in the face, you know it's made with real coffee instead of extract. 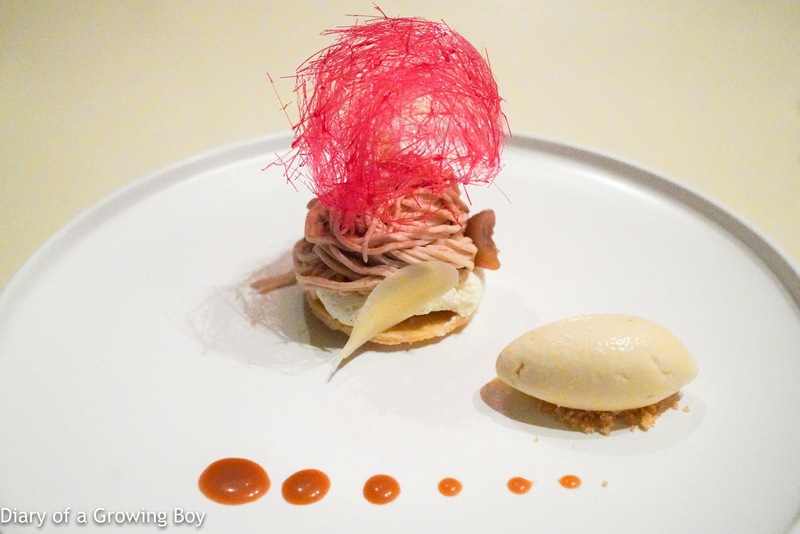 Mont Blanc - this is the season for Mont-Blanc, and tonight this came with a quenelle of white truffle ice cream that was just... delicious. The salted caramel on the side was nice, too. 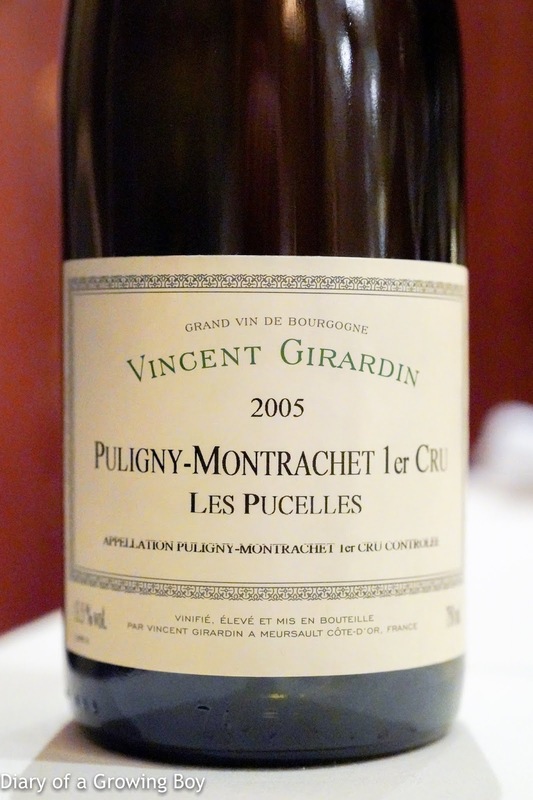 2005 Vincent Girardin Puligny-Montrachet Les Pucelles - good acidity on the palate, almost crisp, with a hint of roundness on the palate. A little toast on the nose, flint, and lemon, with a slight hint of butter. 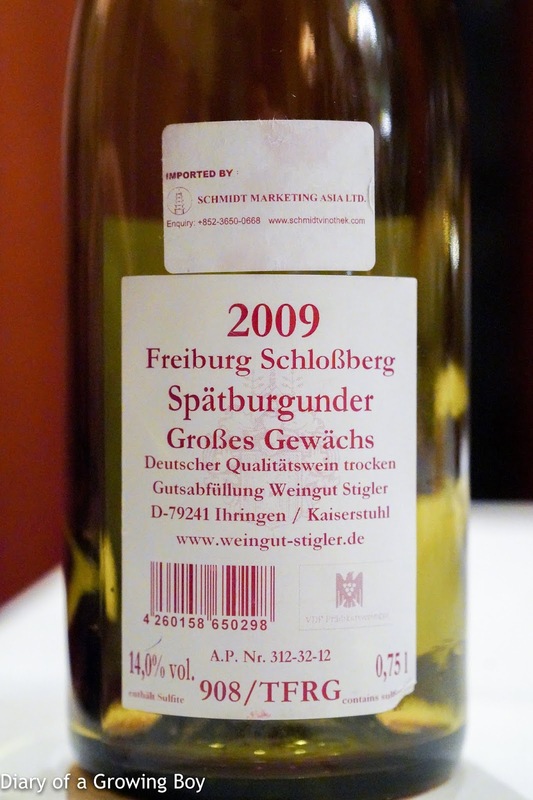 2009 Stigler Freiburg Schloßberg Spätburgunder Großes Gewächs - opened for 1½ hours without decanting. 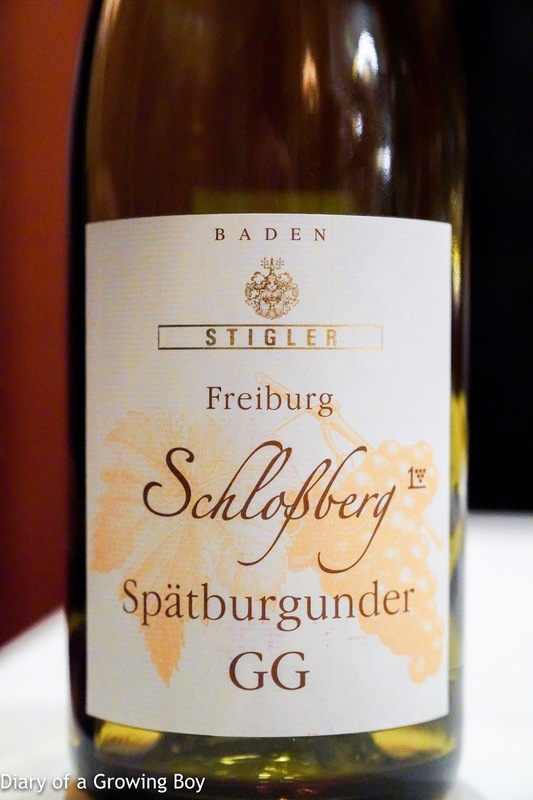 Really lovely with cool fruit, black cherries, sweet but not quite honey-level. Eucalyptus, fragrant oak, dried herbs. Slightly bitter finish. Hello Kitty and I really liked our dinner. 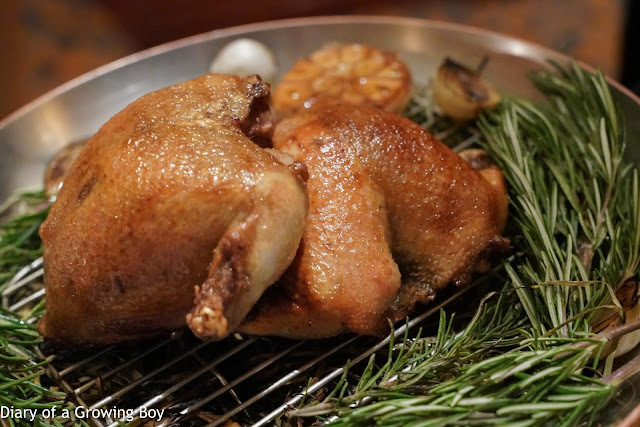 This didn't have the razzle and dazzle of what many restaurants in town offer, but what you get is simple, honest, and most importantly - delicious. It's interesting that Ricardo insists that as a French restaurant, priority be given to using French ingredients - while supplementing from their own rooftop garden. The good thing is that Mr. Cane is now a fan... after having stayed away from the restaurant for a number of years. I'm really, really looking forward to my next meal here, as Ricardo has promised to serve up Venezuelan French cuisine - or was it French-style Venezuelan? I'm sure I would love it.